a little mineral, a little iodine! This was a sample courtesy of Peatbogger. Thoroughly enjoyed it, a real nice combination. A very nice subtle nose. Reminds me of a horses stable. There has been a few that do that. Also detergent soap is also there. This all doesn't sound very good but somehow it works. Also red sulphur matches and vinyl records. This isn't easy to achieve especially with a strong peated whisky but this works well. Well balanced I think with red cherry, sarsaparilla. This has a really good mouth feel to it. It's a little sharp but that's only as a reminder of the 48% alc. A little slap and pay attention. The thing is with the finish, it's the fruity notes that linger and not the smoky ones and they linger for a while with quite an array. The sherry finish and the slightly higher ABV is nice. More intense, but not a heavy one. Rather smoky than peaty. Sherry, dark fruits, salt, sour cabbage. Camphor and grass. Intensive. Dark fruits, caramel and sherry. Peat, smoke and ash. Tobacco and cocoa. Medium length, dry, spicy, ashy. First Big Peat with a sherry cask marrying finish. 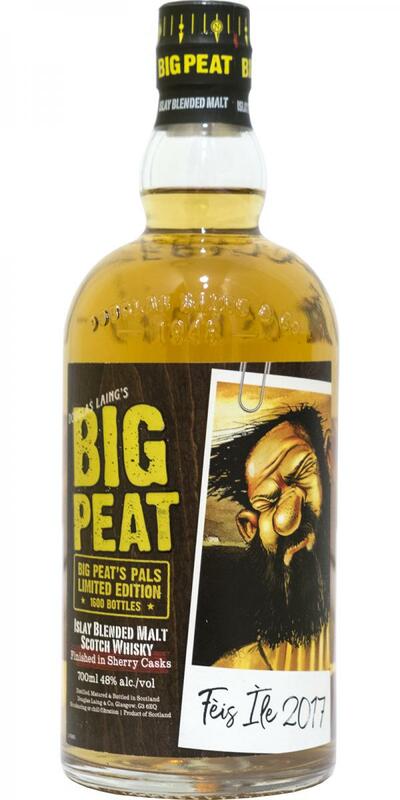 The original Big Peat walked off a trawler at the yeard, crawled through a bog and cursed you from the glass, this is Big Peat straight from the shower, with trimmed beard, dressed up, inviting you to a party. Still you sense he will reak havoc if you go with him. Wow, this must be Peat's brother... quite different than the other BP I have tried. The peat is definitly present, but not as prominent as expected, and is more on the clean smokey side. Sherry finish is clearly noticable, as this has notes of dark red fruit and more spice. At a certain angle I get a very intence pure rasberry juice. Also a slight note of polished hardwood. Hot spice with light peat smoke. Dark red fruits going into sweet creamy caramel. Tobacco with a drop of sewing machine oil before going into the end. A little drying with cocoa and spices lingering. A pleasant and intense blended malt with a nice balance of sweetness, fruitiness and peat smoke. The finish in sherry casks delivers delicate sweet and spicy notes taming a bit of the typical Islay punch. Not entirely complex, but quite a pleasing dram which also tolerates some drops of water.I thank Douglas Laing for the sample! Fresh on the nose with sea air and subtle peat smoke. Fruity notes of red apples and stewed peaches emerge, nicely intermingling with sherry sweetness, liquorice and a whiff of cinnamon. With time, more and more peat arrives. Bold and intense on the palate with a delicate sweetness of barley sugar, red apples and ripe peaches. This is complemented by pepper, peat, ashes and a slightly alcoholic bite. Then sherry arrives, followed by creamy notes of caramel and malt. Gentle peat smoke, tender tobacco leaves and dark chocolate towards the finish. The finish is long, warm, sweet and creamy with vanilla, malted barley and soft peat. Becomes slightly dry on the tail with a touch of cocoa, oak, allspice and ashes. With water: Quite lively on the nose when water is added. There's more smoke and spiciness, while the lovely sherry sweetness is fairly tamed. Still sweet and fruity on the palate with vanilla, malted barley, caramel and apples. The peppery notes are significantly reduced with only subtle warming spices towards the finish. The finish is a bit shorter with vanilla, barley and dark chocolate, nicely wrapped in crisp peat smoke. A very good and quaffable whisky from Islay, especially considering it used to cost £50. The 1.600 bottles that comprised this release are long gone though. Sweet peat, lemons, stewed pears and sauerkraut. There's some licorice, and cinnamon rolls as well. Rich and inviting but doesn't offer a lot of complexity. Smoky and very ashy, with a layer of sweet cherries and dark notes of tobacco and chocolate. Lingers on smoke and cocoa powder, ending with notes of vegetal peat.